With shimmering amber glass shades, this five-light bath fixture offers a pleasant artisan-crafted look. A beautiful fixture that fuses contemporary creativity with classic design. This bathroom wall light features scrolling arms in a rich golden-bronze finish with silver accents. The most beautiful elements are the handmade amber glass shades, in a free-form design that adds uniqueness and value. 37 1/4" wide x 12" high. Extends 7 1/2" from the wall. Weighs 12.14 lbs. Takes five maximum 60 watt bulbs (not included). 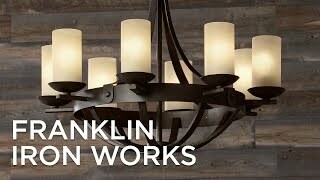 Bathroom wall light from the Franklin Iron Works™ brand. Organic amber art glass shades. Golden bronze finish with silver finish accent highlights. Metal frame construction. Oval backplate. It goes perfectly with the others parts of our new bathroom. I'VE ORDERED IT BEFORE. THE AMBER GLASS WASN'T DARK ENOUGH FOR ME, BUT OTHERWISE I LIKED IT SO WELL I WAS WILLING TO BUY IT AGAIN. Perfect addition to my master bathroom. I have the Amber Scroll 37 1/4" Wide Art Glass and Bronze Bath Light. I'd like to order spare globes. Do you sell them individually? Could you give me the dimensions of the glass shade? BEST ANSWER: The glass measurements are 5 7/8" wide by 5 1/4" high. BEST ANSWER: This item is currently not on sale. But, please feel free to sign up for our mailing list. Signing up for our mailing list you will receive exclusive coupons and notification of our new sales that will take place. I have added a link below for you to get started. Is this easy to return? Sadly, I didn't measure before I purchased this, and it is way too big! Do you have the amber scroll in a smaller version? BEST ANSWER: Yes - there is a four light option Style #V9404. Does the 12 inch height include the scrollwork? Do you know the measurement from the base to the top of the shade if it is installed facing up? BEST ANSWER: The 12" height does include the scroll work, so from the bottom of the glass to the top of the scroll work. Could you be more specific about the other dimension you are looking for? Is it from the center of the mounting plate to the top of the glass if installed glass facing up? I was trying to figure out the distance from the bottom of the mounting plate (so the whole plate) to the top of the globe if the fixture was mounted facing up. The space above the mirror to the ceiling where I would like to install the fixture is 13.5" Thanks so much! BEST ANSWER: The net weight for this fixture is 12.14 lbs and the boxed weight is 20.75 lbs. Are the amber globes available for separate purchase? I'd like to purchase a couple extra in case any get broken. BEST ANSWER: Yes, you can order replacement glass shades for this wall light. Below I have included the style number for the glass shade. Since it is a part order, we will need for you to call in and place the order over the phone. how is it for putting on make up? BEST ANSWER: Yes, it offers plenty of illumination for makeup application. I would consider putting this fixture on a dimmer to control the light output when you would prefer a little less illumination. What are the dimensions of the back plate? BEST ANSWER: We measured the backplate of this item to be 8 1/4" wide, 4 1/4" high and 3/8" thick. Is this fixture available in Orlando area for immediate pick up? BEST ANSWER: Hi - we do not have a store in the Orlando area, but we offer fast and free shipping on this design. If you need it immediately, we also offer expedited shipping options. Please contact one of our lighting specialists at 800-782-1967 and they can help you place your order and give you an estimate on delivery times. When will this lamp go on sale next ? after installing in bathroom I love to walk through just to look at it. It makes are bathroom look elegant. Love the looks of this fixture. It is stunnong and different. We couldn't be happier. Makes our bathrooms look elegant. This light fixture is very high quality and the hand blown glass globes are very unique and beautiful. Absolutely stunning!! Changed the whole look of the room. We wanted to update the bathroom--this was exactly what we needed to do so. Very Happy with LampsPlus. Delivered on time to my front door and in perfect condition. Earthy, elegant and unique in itself. This new light looks great and provides lots of light! I just LOVE this light! Makes my bathroom look FABULOUS !!!! Everyone raves about it! This lamp makes our bathroom so elegant and beautiful! This bathroom fixture fits perfectly with the antique Victorian bed in the adjoining bedroom. The metal is a antique silver/bronze finish. We also purchased the matching lamp fixture for the vestibule. The glass shades add a hand-crafted look to the fixture. These look amazing in my master bathroom! We love our lamp. Looks beautiful in our bathroom. We’re so happy we went with this. I really like the fixture. It has it's own character and gives out a ton of light....works great in my bathroom! Beautiful fixture. Yes I would recommend this to others. Huge presence. Make sure your space is grand enough. Huge fabulous fixture. Glass very transparent-more than in the picture. Well worth the 4 week wait. Completely incorrect description on this fixture! The lights are definitely NOT amber. They are clear with a little bit of brown swirl. The metal is not bronze. It is silver with a light bridging of browns. The metal works is thin and the welds are awful! Hi Deborah P., thank you for your feedback. We apologize that you were not satisfied with the look of your fixture. As stated in our product description, the metal arms are in a bronze finish with silver finish accent highlights, so they may look slightly more silver or bronze depending on the surrounding color and light of the space. Our art glass shades are in a freeform design, so there may be slight variations in tone. If you need assistance, please reach out to our customer service team via phone, email, or chat. Thank you.